Hello, do you have any missing teeth or lost your teeth recently, If yes its big loss for you. Teeth are diamonds in the mouth. Losing them affects overall wellbeing. Tooth loss can be replaced using artificial tooth. The best among them is a dental implant. Dental implants are more natural and perfect replacement for your missing teeth. Dental Implant is a more advanced form of replacement for tooth/teeth. It is a screw like an object which acts as the root of the tooth, normally made up of titanium metal or ceramic material. The dental implant is placed into the jaw bone using a minor surgical procedure. Healthy teeth are not used as support for replacement as in bridge. Most natural replacement of tooth. Reduces the bone loss compared to other replacements. A dental implant has a better prognosis and lasts for more time period. What is the time frame to complete a dental implant procedure? The factors mentioned above determine the treatment period, the total number of visits to dental clinic and completion of a dental implant procedure. Do we experience pain during the treatment? Dental implant placement is a minor surgical procedure done under local anaesthesia or general anaesthesia. The patient may experience slight discomfort during the procedure or after the surgery. The medications prescribed by your doctor will decrease any post-operative pain. Is there any special instructions to be followed before surgery? Use of anti-bacterial bacterial mouthwash. (chlorhexidine). Prescribed antibiotics to be taken before surgery for few days. Kind of food to be consumed during the day of surgery. Any other specific instructions such persons to be accompanied and others. How do I feel after the dental implant surgery? After surgery, there will be minor discomfort due to bruises and swell on gums and soft tissues. The same can be reduced using medications such as painkillers. The procedure for implant involves minor surgery, healing of wound after surgery and placement of artificial tooth on the implant. The procedure takes around 12 weeks to 20 weeks to be completed. The time period varies from person to person. A hole is drilled into the jaw bone to place the implant, which acts as artificial root. After placement of the implant into the jaw, the wound is sutured, and the implant is secured. The implant and jawbone are allowed to heal for next few weeks. The abutment(extension) is placed on the implant body. The abutment holds the artificial tooth. The mould of the implant is taken at this stage. An artificial tooth is selected. The artificial tooth is attached to the abutment which is connected to the implant. After completion, you will be able to chew well, and appearance will also improve. The implant needs to be maintained well with better oral hygiene and regular dental visits. What is done on the day of the surgery? The placement of a dental implant is done in two phases. The first phase is the surgical placement of the implant under local anaesthesia or general anaesthesia. The local anaesthesia is injected, and the area of surgery is numbed to avoid any pain or discomfort during surgery. An incision or cut is made on the gums to expose the bone in the area of interest. A specialised sterilised drill is used to bore the bone to accommodate the dental implant. 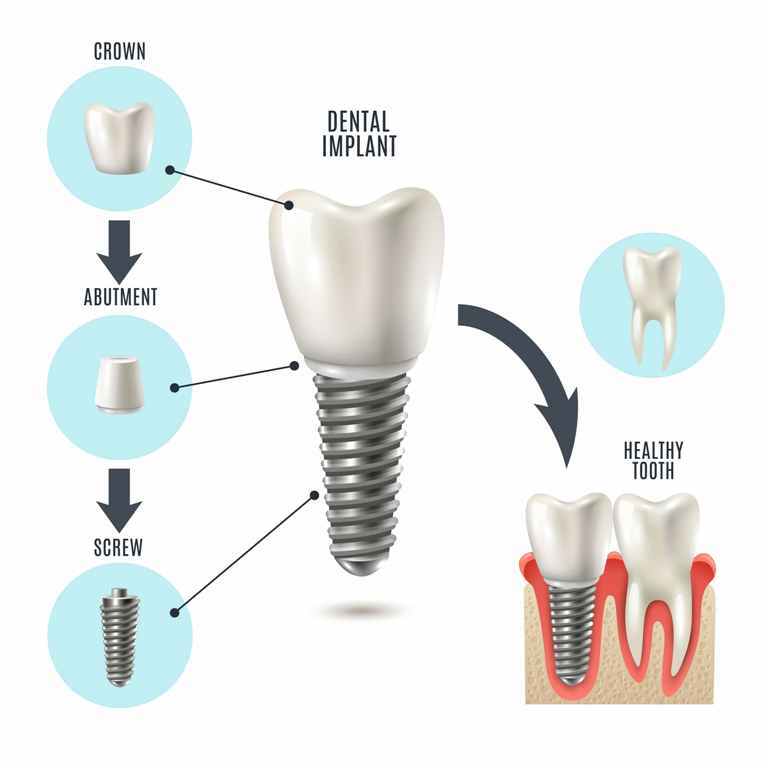 The implant which is screw-like will be fixed in the drilled area. After the implant is placed, a cap like an object is placed to prevent overgrowth of tissues during the healing process. The wound is sutured and allowed to heal. During the course of time dental implant gets firmly attached with the jaw-bone. The second phase starts with exposure of the placed dental implant. An abutment (extension) is fixed to the dental implant, and an impression is taken to create a mould. The crown (visible tooth) is constructed on the mould in the lab. The final step is fixing of the crown to the dental implant. What are the complications if any in rare cases? Implant rejection by the body. Dental implant failure due to non-bonding with the bone. The dental implant needs to be checked regularly by a dentist. Oral hygiene should be maintained using the toothbrush and dental floss. A dental implant needs the same attention as regular teeth. Bone loss may occur due to gum disease and infection. Regular dental visits for plaque control and self-maintenance are crucial for the long life of implants. Professional maintenance: Regular dental check-ups every six months are advised. Any plaque or calculus deposition can be removed during the visit. Home maintenance: Regular tooth brushing and use of dental floss will help in the maintenance of oral hygiene. Who can be a suitable candidate for dental implant treatment? Dental implants are not age specific; they can be used in all ages, they are avoided during growing age as bone growth is still continuing. Implants can easily replace any loss of teeth. Persons with systemic conditions like blood pressure, diabetes and heart disease require special attention and more prophylactic medicines to prepare them for dental implants. How will my teeth look after the treatment? Teeth resemble more natural after the treatment. Can implant procedure be done if I have lost my tooth long time back? Yes, an implant can be placed even in that case also, but if the extent of the bone loss is more, then we need to perform bone augmenting surgery. What is the success rate of dental implant procedure? Dental implant procedure has high success rate compared to other dental replacements. The general health and oral hygiene play an important role in the success of implant procedure. What is the life of a dental implant? Dental implants can last for decades if good oral hygiene and professional care are ensured. Dental implant procedure is done under local anaesthesia. There is less chance of any pain. Most of the patients experience no pain; some may have slight discomfort after the procedure is over. How much time does it take during surgery to place an implant? The time required to place an implant depends on location, accessibility and number of implants. A simple single implant takes around an hour to be placed. After surgery, wounds are sutured, and there are no open wounds. There will mine minor discomfort and swelling in the operated area. The same can be managed using medications. Normality will be restored in 4 to 7 days. How about consuming food after implant surgery? Your dentist provides a diet instruction after the surgery. Beverages, hot food, spicy food are not recommended. Eating soft, nutritious food is preferred. Can I continue to work after surgery? Yes, you perform normal activities after surgery, but avoid hard and strenuous works and also avoid long-distance travel after surgery. What is the time period for healing and placement of crown (artificial tooth)? The treatment differs from person to person according to their treatment plan. The procedure takes around 3 to 9 months depending upon the number of teeth replaced, healing of the wound and general health of the patient.